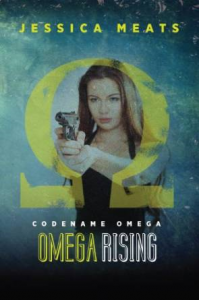 Until the end of October, I am offering a chance to get hold of a free copy of Omega Rising, the first book in my Codename Omega series. 100 copies of the ebook are available – but it’s first come, first served so sign up quickly. Simply follow this link and enter your name and email address to be sent your free copy. You can also choose to sign up to my mailing list to receive publication news about future books. Jenny Harding has no money, no qualifications and no career history. A job working security for a big tech firm seems too good to be true. Maybe it is. And is she on the right side? 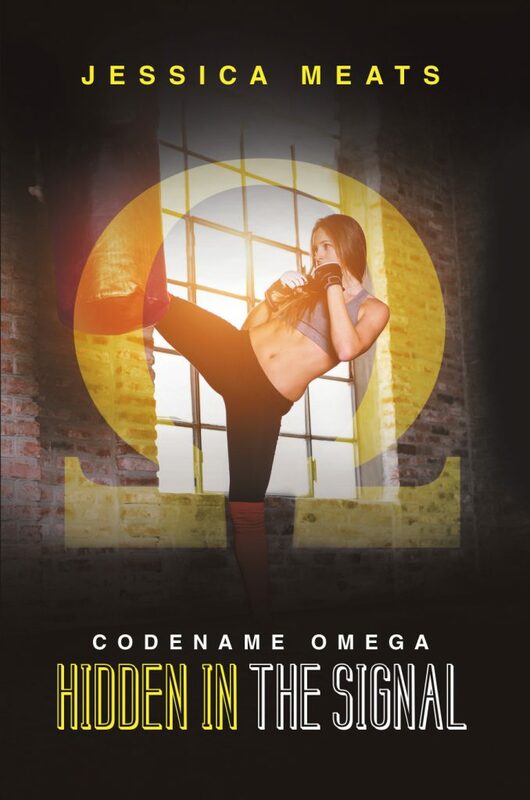 Omega Rising is available to buy on Amazon (UK link, US link). The Codename Omega series is continued in Traitor in the Tower (UK link, US link) and Hidden in the Signal (UK link, US link). 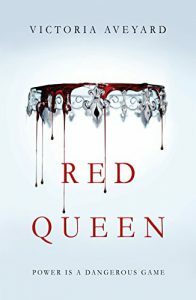 Red Queen by Victoria Aveyard (UK link, US link) has a lot of the standard hallmarks of a young adult dystopian novel, but it approaches them in a way that makes the story feel new and different. It is the story of Mare Barrow, a girl from a downtrodden people who finds herself in the middle of the political intrigue and machinations of the ruling class. The world is divided into Silvers and Reds. Those with silver blood have amazing abilities, including controlling fire, manipulating metal, or even entering people’s minds and controlling them. The reds… don’t. Without power of any description, the reds do menial labour, working as servants, factory workers, farmers, and so on to produce the necessities and the luxuries that the silvers enjoy. Reds are also sent into pointless wars as canon fodder if they can’t get a job soon enough. Mare Barrow is a red girl from a poor village, who steals to help her family survive. When she steals from the wrong person and gets caught, she expects to lose her hand. Instead, she gets offered a job as a servant in the palace. In a very public accident, she and the rest of the world discover that Mare has powers of her own – the ability to control electricity. Because the royal family can’t admit that anyone with red blood has power, they create a fiction that Mare is the lost heir of a silver family, and betroth her to one of the princes. Mare is suddenly trapped in a world of politics and intrigue. If she plays her part, she can keep her family and herself alive, but there is a rebellion stirring and she might be in a position to help all reds in a way she’d never imagined possible. What I like about this book is the way that the characters all feel like people. There are a lot of different personalities mixed in, from the major characters to the minor ones, and they all have layers. A character who is cruel and vicious shows that they can be a loving parent. A character who at first seems kind and caring can find ways to rationalise brutal actions and a status quo that hurts millions of people. In the world of the silvers, there are characters you can connect with and feel sympathy for, even while they turn a blind eye to the fact that reds are being downtrodden. This focus on the people makes the book feel very real. Even in this sci-fi/fantasy setting, the reactions of the different characters to the events of the book felt very genuine. The plot is also one that kept me hurrying through this book. It has layers and factors, with the in-fighting within the silver houses, the rebellion of the reds, and Mare just trying to keep her family and friends safe. There were twists I didn’t see coming, but afterwards I could spot the seeds that had been leading up to them. One thing I struggled with was trying to keep track of all the different silver houses, their house colours, and their powers. Fortunately, part of the story involved Mare struggling to learn all that, so there were reminders and it became another way to connect with the protagonist. If you enjoy YA dystopias, I definitely recommend Red Queen. It’s the first of a series and I have the second one on order and I’m looking forward to finding out what happens next. 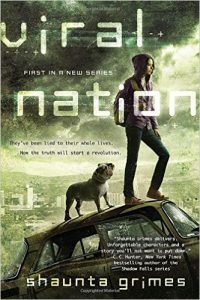 Viral Nation is a post-apocalyptic book with many of the standard hallmarks of a YA dystopian story. The world was ravaged by a deadly plague and now the few survivors have come together into a small number of cities. They are all reliant on a drug that keeps the virus suppressed. Without regular doses, the virus will return. In the cities, law is kept because a time portal lets the authorities know what crimes will be committed so that they can stop them before they happen. Clover is an autistic girl who depends on her support dog Mango to help her through loud and crowded situations which are incredibly stressful to her. She is extremely intelligent and is accepted into the prestigious Academy, only to be told that Mango can’t stay with her. When she refuses to be parted from her dog, she is sent instead to be a time mariner – to travel through the portal to bring back information from the future. In her new job, she learns that the system may not be as perfect as she’s been told. The story is told largely from the perspectives of Clover and her brother West, with occasional sections from their father’s viewpoint. Clover’s character is a real strength for this book. Her experiences and thought processes are clearly described and made understandable to non-autistic readers. The way she behaves feels completely genuine and there is a real emotional connection. That feeling of reality is also reflected in the way she is sometimes treated by other characters in the book because of her autism. There were times when I felt fury and indignation on Clover’s behalf about the unfairness of how she is treated and I wished I could leap into the pages and yell at the other characters. On the other hand, I didn’t think the plot did justice to the strength of the main character. There were a number of plot elements that seemed really convenient. I don’t want to give spoilers, but in particular the way the time travel is handled seems to lack consistent logic and there are details that are revealed that make no sense and seem to be there only because it furthered the plot. The book also suffered a bit for being obviously the first one in a series. There are a lot of significant plot points that go unexplained which is frustrating, but I know I do this in my own series, so I can accept this. I trust that these mysteries will be resolved in the second book of this two-part series. The second book is already out, so at least I won’t have to wait to get the answers. This isn’t going to make it on to my favourites shelf, but it’s an enjoyable read if you like dystopias and especially if you like well-written representations of autistic characters. Three and a half stars. 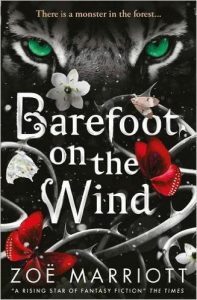 Barefoot on the Wind by Zoe Marriott is a book very loosely inspired by the fairytale of Beauty and the Beast. It is described as a companion book to her earlier book Shadows on the Moon and is set in the same Japan-inspired fantasy world, but it deals with completely different characters and situations so you don’t need to know anything about that first book to enjoy this one. Hana’s village has been cursed for generations. Surrounded on all sides by dark woods that house a monster, the village is completely cut off from the outside world. Every month, on the dark of the moon, a villager will disappear into those dark woods never to be seen again. When Hana’s father vanishes, Hana follows him and finds him bleeding and unconscious in the woods. Even when she brings him home, he won’t wake from his enchanted sleep, so Hana goes back into the woods to fight the monster and try to break the curse in order to save her father’s life. While there is some action and Hana is a hunter, much of the book focuses on the emotional journey rather than on adventure. It deals with grief and anger, particularly as Hana comes to learn of the nature of the curse. Despite being a book full of magic, the emotions behind it all feel very real, very human. The reactions of Hana’s neighbours, the way her father acted after Hana’s brother’s death, and even the acts that started it all, all feel genuine. It’s also pretty clear that Hana suffers from periods of depression, but this doesn’t define her or her story. I think this is very important. In places, the plot was a little predictable, largely because of the fairytale source, but Marriott approaches it in new and interesting ways. The explanation of the curse was something that made perfect sense when it was revealed, without being something I guessed ahead of times. This isn’t my favourite of Marriott’s books by far (I much preferred Shadows on the Moon) but I did enjoy it and I would recommend it if you enjoy young adult fantasy. Four stars. Last weekend, I was at St Leonard’s Festival, an event which included a vast range of events from market stall to folk dancing, puppet shows to a performance of Midsummer Night’s Dream in a park. One of the events was a workshop with author Helen Comerford, who as part of the workshop did a reading from her book. I took a recording on this opening. 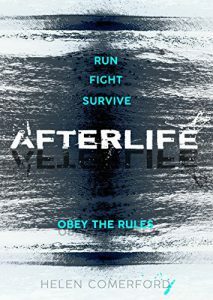 You can find out more about her book at http://afterlifethenovel.com/ or check out the book on Amazon. 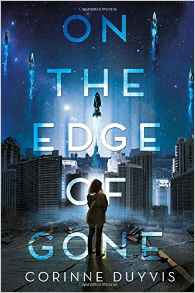 On the Edge of Gone by Corinne Duyvis is a brilliant book. The only downside to this book is that you will need to bring your tissues because it’s emotional and heart-breaking and poignantly written. The story is set during a global catastrophe. A comet is about to crash into the Earth, devastating the world and doing massive damage that will last for years to come. Society has been preparing for the comet, with permanent shelters for some people, and generation ships to take others off-planet, but there aren’t nearly enough resources for everyone. Most of the population will just have to survive as best they can with temporary shelters and then hope they have homes to go back to after the impact. Thanks to a chance meeting, Denise and her mother end up on board a generation ship that hasn’t launched yet, but they won’t be allowed to stay. Denise is determined to find a way to earn a place on the ship, but those in charge look down on her drug-addict mother, and in the meantime her sister is missing. Outside the ship, people are fighting for survival and Denise doesn’t know if her sister is alive or dead. The emotional impact comes again and again, as Denise deals faces the difficult decisions and challenges of trying to save a few people she cares about when so many others are suffering. Survival for some is going to be at the cost of others, and the author makes you feel every minute of it. This book also does amazingly well from a diversity standpoint. Denise is a mixed-race, autistic girl and, as the book is written by an autistic author, her portrayal feels genuine and not remotely stereotyped. The book also contains: characters of a range of races and religions; a trans character; other LGBT characters; disabled characters; a character with Downs syndrome; and so on. Some of these are major characters, others are in the background, a few are just mentioned in passing, but it all adds up to a world in the story that feels like it represents the true diversity of the world around us. This adds to the emotional impact of the story because it feels like this disaster really is affecting everyone.